Your kid's don't like rhubarb you say? That may be so ... until you make them Rhubarbsicles! Imagine ... a homemade Rhubarb Popsicle Recipe with yogurt and applesauce for a kid's frozen treat that includes a VEGETABLE! Rhubarb is a nutritious vegetable, therefore, this version of that ageless summer treat, the popsicle, is not only full of flavour, but healthy too! 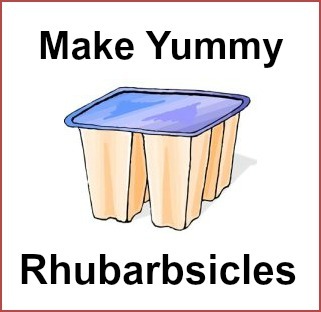 Here follow two recipes for Rhubarbsicles, one with plain yogurt, and one with strawberry yogurt and finely chopped fresh strawberries! Both recipes include applesauce (homemade or store purchased). Why not treat your kids to these delicious, frozen treats for snack time or dessert. Be sure to make enough for the adults to enjoy them too! Note - Use the link below for the stewed rhubarb recipe, but you can omit the optional Jello/gelatin that the recipe uses. In a large bowl thoroughly combine the above ingredients and freeze in popsicle moulds for several hours prior to serving. Note - Use the link below for the stewed rhubarb recipe, but you can omit the optional jello.